[ENG] Fear is a liar ! 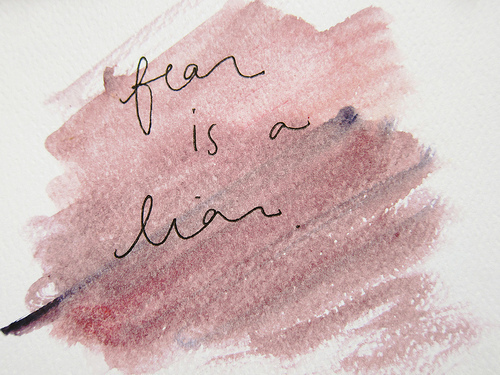 fear is a LIAR ! There are a lot of things that i can’t get enough to say Thank You for. As now i can sleep safe and sound without waking up because of the itch or bad dreams, i can wear any kind of fabric as my clothes, take a bath twice a day, wash my hair once in two days (as i also had a severe seborrheic dermatitis – that caused me swollen lymph nodes, and it was painful and also frustrating), i can now work, go to the malls, watch movies, ride motorcycle with so much ease. For His sufficient grace, My life has turned to the better. There are so many things that we usually worry about. As we know that worrying things won’t get us anywhere, but still isn’t it always comes by? And worry always comes with his friend which we call Fear. Sometimes worry not only comes when everything seems to falls apart, but even in such a better and perfect condition. Have you ever worried that your “just getting better” life changes to the worse? Well, i have. I worried about some little blisters on my skin, and sometimes it’s just a mosquito bites! You may think that i’m ridiculous, but try to think and feel as a person who lives with itch, scars, and ooze for more than half a year. I begin to forget how it feels to be itch free, blisters free and ooze free. I begin to forget how normal feels. I can say that i am not used to this “freedom”. I have been living in “pain” for quite some time, that sometimes i can’t enjoy my freedom because it’s just too different, too good to be true and also too scary (for a thought that maybe this could be just a temporary). This unconsciously made me “not enjoying” my better life freely with all my heart. The thought of “i am not worth this better life, i am not worth this grace” somehow sometimes becomes bigger than it should be. It blocked me from enjoying all of these grace. Thank God that He is a very great God, and He once again reminds me that i can enjoy His grace freely for His grace is unconditional! it means that you doubt His heart! Your fear means that you replace His unconditional love for a conditional love! You are thinking that this kindness will be taken away. Do you really think He is that kind of God? That helps you for a while and throw you to the sea to die? He is not that kind of God, that will be a human doing not God. As it said that His love is unfailing and everlasting. Believe and enjoy your grace everyday with joy and thanks giving! How i overcome my worry and fear, and begin to learn to enjoy every little grace i have now? By pray i believe that He is my God, He is the one who never abandon me His daughter, He saves me, He heals me, He is the only one i can trust. As i said above that Fear is a LIAR! Do you know that most of the things we are worrying or fear about aren’t really happening? Notice the word likely? Likely means Probably. And probably means that it’s not certain to happen. you are the one who holds the key for everything fear offers you! it’s all depends on you, it’s all in your decision. When you decide to live in fear, there’s nothing good come out of it. But when you decide to overcome it, you’ll see that everything is not really happening as your fear and what is happening really is not as your fear offers you to see. To fight fear, you have to do it on purpose! Delete every scene that fear shows you in your mind, replace it with hope. You can not fight it when you don’t decide to fight it on purpose. Take control of your mind and don’t let it control you over. [ENG] My list of Body Care Products that are safe for Sensitive Skin!